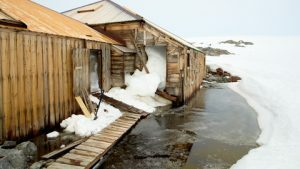 Global Travel Media » Blog Archive » Last Cabins to Mawson’s Hut on sale now! Last Cabins to Mawson’s Hut on sale now! Come in search of Australian Antarctic history from the heroic era of exploration. Katabatic winds and ice conditions are sure to influence the itinerary. Travelling at the most favourable time of the Antarctic summer and with an unprecedented 10 days exploring this region of Antarctica allows true expedition style flexibility, enhancing your chances of landing at Cape Denison and stepping inside Mawson’s Hut. Don’t worry this voyage is not all history and old huts. 7 days exploring the sub-Antarctic Islands, particularly Macquarie Island, presents unimaginable wildlife experiences. Known as the Galapagos of the Southern Ocean, Macquarie Island is home to rugged landscapes, rustic outstations, unique flora and a number of the world’s most iconic species including; King penguins, Elephant seals and the Wandering albatross. While in Antarctica you will be on the lookout for whales, Orca and of course, Adelie and Emperor penguins. Exceptionally priced to include an additional 4 days cruise at no extra cost, plus receive AUD$750 per person flight credit, it’s unlikely that this unique itinerary will be available again. 30 Days Exploring for the price of 26 / Save up to $13,500 per couple! *Cabin Pricing is in USD$ per person based on twin share and includes required USD$880 per person landing fee. AUD$ pricing based off an exchange rate of AUD$0.78, final balance due 08 OCT 2017. Flight credit is not redeemable for cash. Subject to availability. *A true expedition voyage operating with a flexible itinerary, landings at Cape Denison and Mawson’s Hut are not guaranteed. iExpedition provides specialised knowledge for Polar expedition cruises to Australian travellers. Search the complete Polar voyage range online at www.iExpedition.com or contact iExpedition directly on 1800-960-577 to start planning your polar experience.